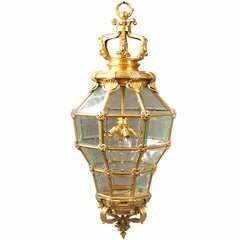 This hall lantern has been exquisitely crafted from glass and gilt bronze (ormolu). The piece will look wonderful placed in a grand entrance hall, living or dining room. The light it produces will reflect of its lustrous gold surfaces, causing the piece to glimmer. 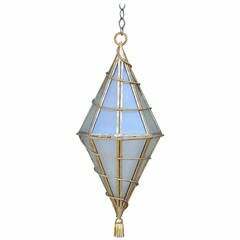 The lantern is composed of a central gilt bronze stem, which extends down from a leafy top canopy to form an eight-light candelabrum. This features a foliate dish and curved branches, topped by leafy drip-pans and urn-shaped capitals, which hold candle-tubes. The candelabrum is placed within a shaped, cylindrical case, crafted from several curved panes of glass. This is suspended from the ceiling by four foliate gilt bronze branches, which are fitted to the lantern’s gilt bronze frame. This is composed of a leafy shaped top, twisted columns with acanthus leaves at their tops and bases, and a lower band, decorated with stylised foliate motifs. 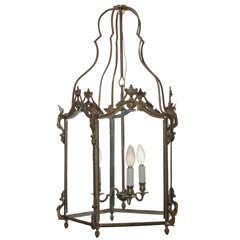 An Empire hanging glass lamp/lantern with gilt bronze mounts with one candleholder on the inside, early 19th century. The glass painted. 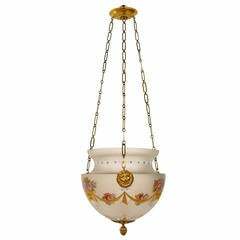 Renaissance revival gilt bronze lantern chandelier-gilded and cold painted bronze with original amber slag glass and original ceiling cap. 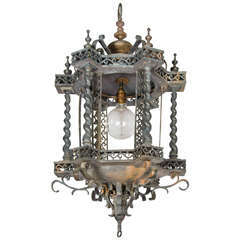 Unusual decorative pagoda style toleware and bronze hanging lantern, circa 1900. 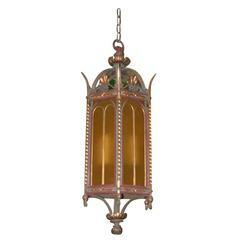 A Louis XV style gilt bronze hexagonal hall lantern with three lights.